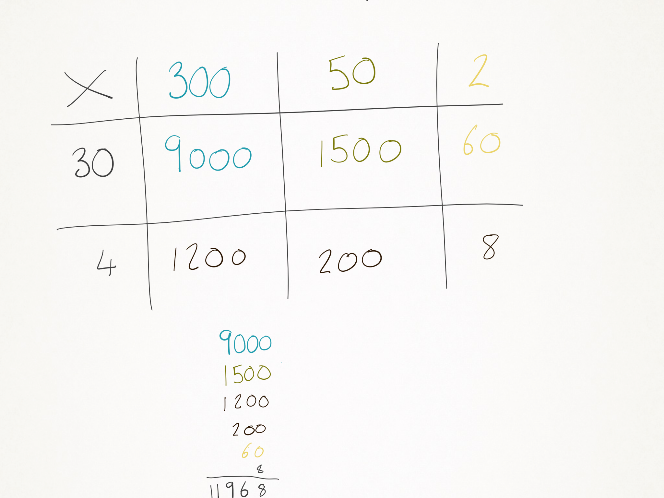 Want to know how to teach multiplication to KS2 Maths pupils? You’ve found the right place! Moving swiftly on from algebra, the next bootcamp post is on multiplication. It seeks to help school leaders, Maths coordinators and upper Key Stage 2 teachers diagnose where pupils are struggling with ‘the nuts and bolts’ of primary Maths multiplication in the National Curriculum. We then track back to different stages of understanding and provide strategies that can be used with whole classes, booster groups or alongside 1 to 1 interventions, such as those provided by Third Space Learning. Pupils keep making mistakes with their written methods…why? Why aren’t pupils using their multiplication tables to help them? My pupils are okay with arithmetic, but they can’t use their knowledge in other situations. DIAGNOSIS: what are pupils’ key misconceptions in multiplication? Antoni has a rapid recall of most multiplication tables. He is able to use these in the written method, usually calculating 4 digit by 2 digit numbers correctly. However, Antoni struggles to apply his knowledge in problems where multiplication facts could help cut down his workload. Stage: SECURING. Rachel can use some number facts within the written method of multiplication, although she frequently still uses her fingers to help her. Through time and repetition she has learnt how to carry out the method but struggles with larger numbers such as 4 digit by 2 digit numbers. She often makes errors with the written method and with those larger calculations. Stage: EMERGING. Jenny can recall most of her times tables and use them in the written method. She struggles at the larger-end with some errors in individual elements due to mixing up her columns. Jenny struggles to use her knowledge of multiplication for the inverse, particularly with division problems where multiplication facts could support her. Stage: DEVELOPING. Lewis finds recall difficult. He knows some number facts but not complete sets such as recall of the 3 times table. He has a small working memory and even with concrete materials he doesn’t seem to grasp multiplication as arrays or repeated addition sufficiently to build on it. Stage: PRE-BOOSTER. Lewis’ needs are beyond the scope of a booster group or this post. He needs specifically targeted 1-to-1 support such as that provided by Third Space Learning to catch him up to a point where booster intervention could be considered. Without a secure understanding of multiplication tables, pupils like Rachel will continue to lack confidence and struggle when manipulating more in depth calculations. Let the amount of time left teaching these pupils guide the extent of number fact development. You don’t want to end up slightly improving their number facts without filling in the significant other gaps that the children have, however you also want to ensure they develop their number fact fluency. It is key that these pupils understand what multiplication is, rather than purely learning to do a written method. If they understand what they are doing and why they are doing it, they will be much more successful when eliminating errors in complex written methods. Briefly start with multiplication as repeated addition, showing groups of 8 with physical objects such as counters or multilink whilst also displaying a blank number line that gets filled in as you count the groups of counters with the pupil (8 + 8 + 8 + 8). Quickly move on to showing the objects in an array form to show the commutativity of multiplication, which will support pupil’s application of multiplication in the written method and using and applying contexts (if they are prompted and links made at the time, to begin with). Once pupils fully understand these aspects of multiplication, we recommend that you introduce the grid method as a bridge between physical approaches and the abstract written method. This will support their understanding of the process. However, if pupils are completely unfamiliar with the grid method, it can be skipped, as it is being used here as a means to an end rather than a method to learn in itself. Give pupils the calculation 38 x 7. Using different colours for tens and ones, model using the grid method to partition the 38 into 3 tens and 8 ones (this is a key step as it will support the move to the written method). Explain this will help us carry out the multiplication as 30 x 7 added to 8 x 7 is a lot simpler than 38 x 7. Ask pupils to calculate 3 tens multiplied by 7 ones. Watch for, and then guide pupils to think of this as 3 (tens) x 7 rather than 30 x 7, again supporting the next move to the written method. Then they can think of their answer as 21 ‘tens’, shown by placing zero as a place holder in the ones (moving the answer to ‘tens’). If needed, get pupils to draw this as two hundreds and 1 ten to deepen their understanding. Then the pupils calculate 8 ones x 7 ones. If they struggle with their 7 times table, they should be nudged to make earlier links with commutativity (arrays) and use their 8 times table. Pupils should then be shown to use the written method of addition to add the two results together (210 + 56) even if they can do this mentally it will support an element of the written method. Once the key elements above are understood (partitioning and calculating tens and ones separately, thinking of the number as 21 ‘tens’ rather than 210, and adding the totals using written addition), larger calculations can be examined. Here, base 10 concrete apparatus can be used to support struggling learners. Now calculate 352 x 34. This will take some time using the grid method but it is an important step. Partition into 300, 50, 2 x 30, 4. 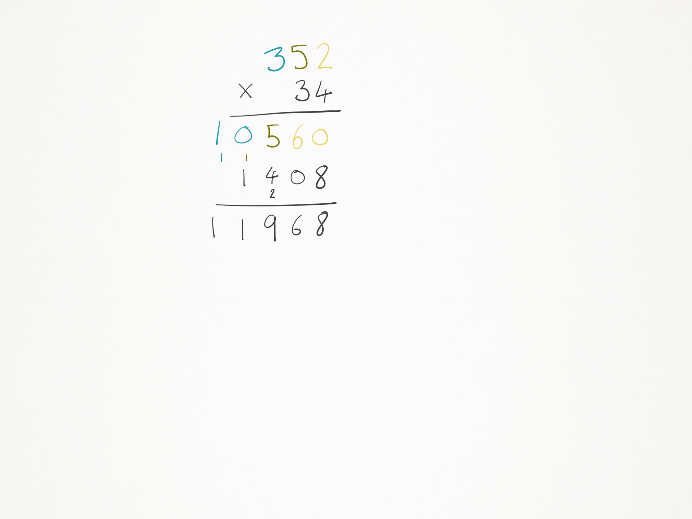 Again, use colours for each sized digit and relate these to using colours in each calculation. 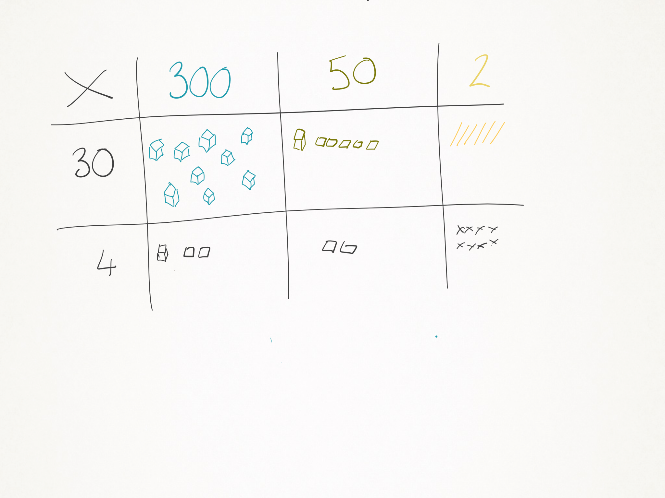 For each stage in the calculation, get the pupilsto think about the size of the numbers they are adding which can be achieved by using drawings to represent the thousands (mini cubes), hundreds (squares), tens (diagonal lines) and ones (crosses). Pupils then add up all totals together using a longer written addition like the one below. Discuss with pupils how this took a while and there is a quicker method we can look at to help us. They then should be able to explain what they know about the method (formal written method). It is at this stage that pupils like Rachel and Jenny are ready to develop their fluency together. As with the previous extensive grid method example shown (if not calculated with all pupils), we will repeat the calculation with short multiplication. The key here is to constantly make links between what the pupils understand/see with the grid method compared to short multiplication. The initial layout should be straightforward: using the same colours as with the grid method, show how we are calculating the same elements, including the partitioning, but just vertically rather than in a grid. Then highlight how we still use written addition underneath to calculate the total, just as we did with the grid method. This will help pupils understand what is happening with the layout. You should give pupils time to calculate further short multiplication involving HTO x O and HTO x TO. When they fully understand and are able to see where each of their sub totals comes from and their relative size, they are ready to move on to long multiplication. As previously modelled with the grid method and short multiplication, take the same calculation in short multiplication form and model long multiplication alongside it. Explain that the main difference is how we compress each subtotal into the same column and use exchanging to do so (just as with written addition). Initially focus on the layout, showing how the same process is being followed until pupils are clear with this. Then switch focus to the relative position of each calculation: i.e when calculating 3 hundreds multiplied by 3 tens, discuss what 3 hundred x 3 is (900). As such, to find out 3 ‘tens’ rather than 3 ‘ones’, it must be 10 times bigger than 900, which is 900 with an extra 0 as a place holder (9000). Typically, this stage is difficult to explain without resorting to ‘adding zeros’ and also where pupils like Jenny and Rachel are likely going to struggle. Therefore, where necessary refer back to the same stages in short multiplication and even the grid method. Try to ensure pupils are always explaining what they are doing, how they know, what the subtotals should be and why. After a while, they should be able to refer to the previous example as 3 x 3 = 9 and then count the zeros (two in 300 and one in 30) concluding they need to move 3 positions larger because of this. Once pupils are fairly secure here, they can be reintroduced to 4 digit by 2 digit calculations. Rather than being used as a separate element (as explained here) pupils who are not applying their knowledge of multiplication tables to division problems should be constantly nudged to do so. Many pupils who are not secure with recall of their tables will choose a formal written method. Indeed, even pupils that are confident with their tables may do so as they see it as ‘the right way’ or ‘the grown up way as we have been taught this more recently’. Yet, it is crucial that pupils learn to be mindful and apply whatever method they think is the most efficient to any given situation, rather than the most recent one they have learned. For example, when tackling a word problem that has 492 ÷ 12 at its core, pupils should be able to use their knowledge of place value to tackle this as 492 ÷ by 10 = 49.2. They then half this to give an answer of 24.6. 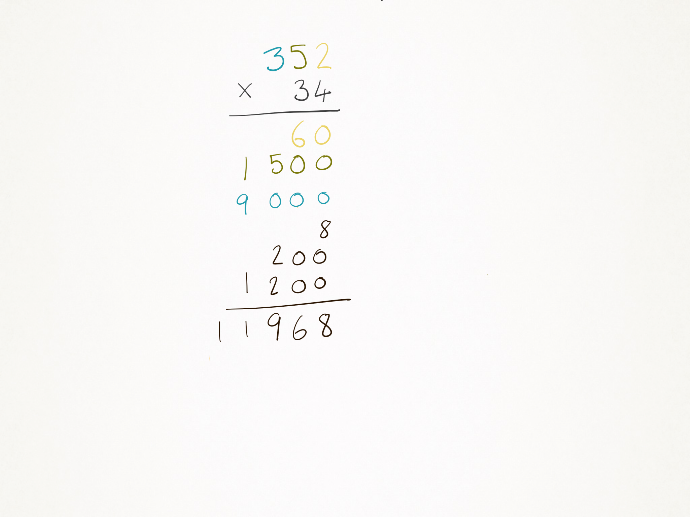 Equally, when tackling 390 ÷ 3 the pupils should see 390 as 39 tens, and ‘we know that 3 fits into 39 thirteen times so 3 must fit into 39 thirteen times. So it fits into 390 one hundred and thirty times. From this point in, pupils just need lots of practice of choosing the most efficient method (as they should have been doing throughout their Mathematics) and applying it to using and applying contexts. Every school has at least one Antoni. Quick with recall and good with written methods. But do they apply the most efficient method when tackling problems? No, they often go for a mental strategy when they should have used a written method, making errors, or jump straight to a written method when it isn’t needed. Here are 2 situations and examples with strategies that can be used whenever these issues arise with pupils like Antoni, whether in class or as a focused booster. 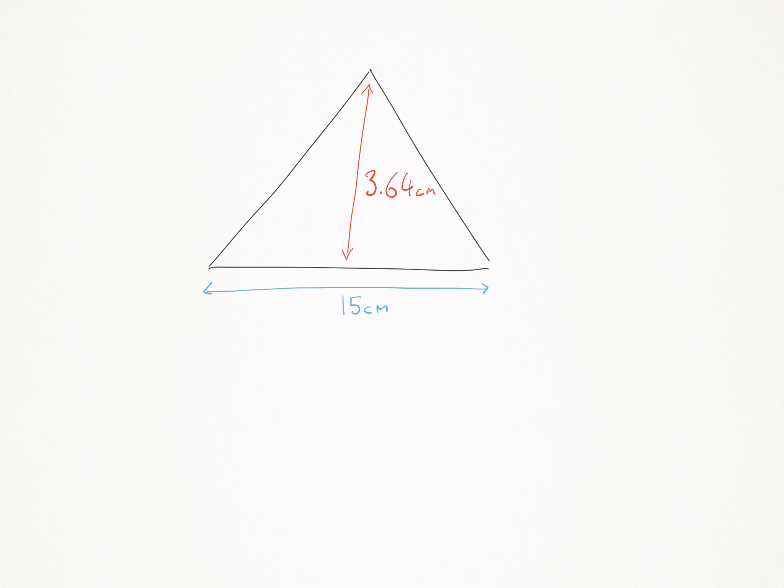 When calculating the area of a triangle, pupils will often leap straight away to ‘the method we have learnt for this situation’. Whilst there is nothing wrong with this, we want them to go further and think of the best way to calculate it. Otherwise, they will simply use whatever they were taught with the method in question (in this instance, area of a triangle). This will likely mean they leap straight to a formal written method when there may be a more efficient method. A quicker, more efficient method over long multiplication that would still minimise errors would be to mentally (with jottings) calculate 3.64 x 10 = 36.4. Pupils could then find half of this amount (18.2) and add it to 36.4 to give a total of 54.6cm. This would be significantly quicker to calculate over a 3 digit by 2 digit written method, potentially involving decimals. But how do we get pupils to ‘see’ this? We need to train them over time to be mindful and spend a few seconds (once they know what they are being asked to ‘do’) to look at the numbers and what they know about them in relation to this. In child speak we would expect their internal voice to say, “15 could be split into a 10 and a 5. Multiplying by 10 is easy. Then I just halve my answer to find 5 times, because 5 is half of 10. Then I’ll add those 2 bits together to find 15”. Tao is thinking of two numbers. When the large number is subtracted from the smaller number, the difference is 5. When they are multiplied together, the answer is 36. What are the 2 numbers? There are a few methods that could be used to solve this and there’s nothing wrong with trying a few method to figure out how best to solve it. However, it is always best pupils look at what they know before they do this. Here, pupils may be mindful by thinking about how the problem involves subtraction (so addition may be useful) and multiplication (so division may be useful). This would be one possible example of a child showing mindfulness. It does not mean it is the most or only efficient way, but it demonstrates how using what they already know can support them in directing their pursuit of the answer. Pupils that use mental strategies when a written would have been more efficient are often harder to ‘crack’ as they will flit from never using written methods to always using it and back again. It is because of their lack of mindfulness that this is occurring. Tackling problems such as those above with these pupils in boosters or whole classes and ‘lifting the veil’ on the potential approaches taken will develop the same skills in them. However, at the end of the day, we want them to eliminate errors that can be made when overusing mental methods. So as a general rule of thumb and sticking plaster for these pupils while building their mindfulness, stop them when they are mid calculation and ask them whether they feel outside their ‘comfort zone’. If they are, ask them if they could jot anything down they haven’t yet that could put them back in their comfort zone. Then ask if they can juggle what is in their head with their jottings and if they are still very clear in what they are doing/where they are going. In other words, are they being stretched too far in too many directions? Alternatively, if you are looking for some times tables help in the classroom take a look at our post on times tables grids and how you can make the most of these simple resources! P.s. If you are a parent looking for help, here’s how you can help your child learn times tables at home in a handy parent guide!